The European CHAIN-REDS project, which ran for 30 months starting in December 2012, worked to promote and support technological and scientific collaboration across e-infrastructures established and operated in different continents, in order to define a path towards a global e-infrastructure ecosystem. The CHAIN-REDS vision is that this ecosystem will enable virtual research communities, research groups, and even individual researchers to access and efficiently use worldwide distributed resources (e.g., computing, storage, data, services, tools, and applications). A booklet published last month gives an overview of the project's success in facilitating this ambitious vision and assesses the project's global impact. The CHAIN-REDS booklet gives an overview of the project's success in facilitating its ambitious vision of interoperable, globally accessible e-infrastructures. Image courtesy CHAIN-REDS project. The research and education community is increasingly reliant on the availability of computing, storage, and data resources around the globe. This is due to the scale of current scientific challenges, which require large collaborations distributed across many countries, and the great potential of digital infrastructures, which facilitate remote research across distributed resources. The CHAIN-REDS vision is that all researchers from every continent should be able to access, use, and share computing, data, and services, thus creating truly global virtual research communities (VRCs). CHAIN-REDS stands for 'coordination and harmonization of advanced e-infrastructures for research and education data sharing'. It was a seventh framework program (FP7) project co-funded by the European Commission Directorate General for Communications Networks, Content, and Technology (DG CONNECT). Building on the outputs and significant momentum of the CHAIN FP7 project and expanding on a considerable background of knowledge and extensive international experience by the consortium members, the CHAIN-REDS project began on 1 December 2012 and ran for 30 months, becoming a de facto flagship EU project in the field of global e-infrastructures. In the last 15 years, e-infrastructures have created a solid basis for ubiquitous access to computing, data, and other remotely accessible resources used in modern research. It's a fundamental requirement for global research that distributed resources can be used by VRCs spread across multiple continents, sharing both data and services. Europe can thus play a relevant role, not only in disseminating, exchanging, and reinforcing the best practices currently adopted in Europe and other continents, but also in promoting the progress of interoperability among different regional e-infrastructures. Research is becoming increasingly global, with international teams working on the key scientific topics of our time (e.g., climate change, genomics, etc.). The national and regional initiatives implemented to provide e-infrastructures with advanced services still face many barriers in terms of truly connecting researchers across continents. The CHAIN-REDS project has been working to help bridge these gaps by coordinating and harmonizing e-infrastructures across continents. CHAIN-REDS has also capitalized on the efforts and experience of previous cross-continental projects and has built on the most recent developments in terms of cloud, high-performance computing, and data infrastructures. A new booklet published by CHAIN-REDS shows that many of the project's ambitious objectives have already been translated into results and achievements. 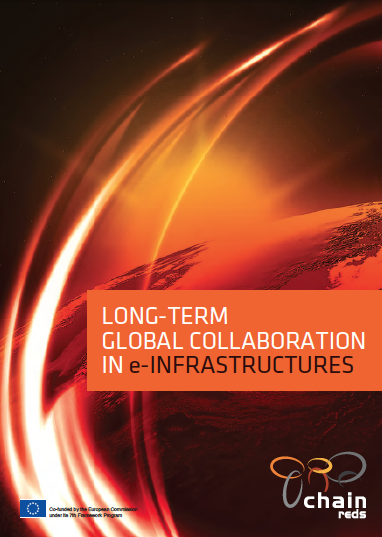 The booklet also gathers the opinions of relevant stakeholders of regional e-infrastructures and policy makers. An impressive panel of international stakeholders present their opinions and considerations about the current situation of e-infrastructures. The picture that emerges is one in which the vision of global, interconnected e-infrastructures has brought a plethora of benefits to researchers worldwide. There is increasing institutional support for this vision in countries outside of Europe. Nevertheless, concern remains regarding the uncertainty associated with current funding models, as well as around the difficulties in achieving equal partnerships across countries. Testimonials from stakeholders in four continents highlight the crucial role that projects like CHAIN-REDS and its predecessors had, and continue to have, in the development of a truly global digital environment, where different e-infrastructures are becoming interoperable, and where partners from developing countries are beginning to have the same opportunities as those in the traditional first world countries. Thanks to these kind of projects, many countries are increasingly able to attract their home-grown talent to work locally in their new and emerging research facilities, with growing support from their local governments. Find out more by reading the full booklet on the CHAIN-REDS website, here. This article was provided by the CHAIN-REDS partnership.